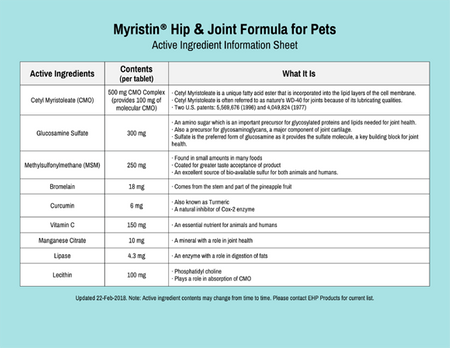 Myristin® Hip & Joint Formula for Pets combines the best joint health products, including Glucosamine Sulfate and Methylsulfonylmethane (MSM), with EHP Products’ signature product, Cetyl Myristoleate (CMO), in a chewable tablet. The CMO Complex in each tablet offers 100 mg of molecular CMO. Will dogs or cats like the taste? An all-natural bacon flavoring makes tablets highly palatable to dogs and cats, so much so that they can even be used as treats. Some competitors' joint formulas omit MSM from their products because dogs, in particular, do not like its taste. The MSM in Myristin® Hip & Joint Formula for Pets is coated, so there is no taste to it and no need for excessive flavorings. This makes it far easier to administer MSM and helps to make it affordable. 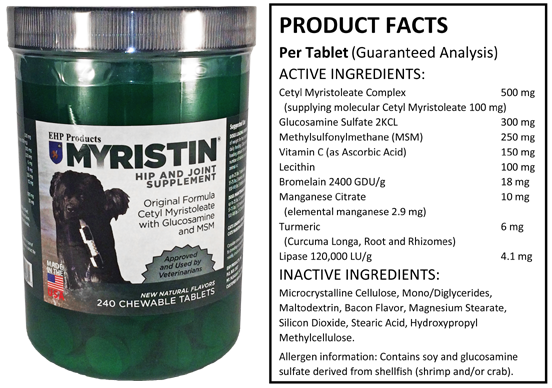 Myristin® Hip & Joint Formula for Pets comes in two convenient sizes: a small 120 count tablet bottle and a large 240 count tablet bottle. 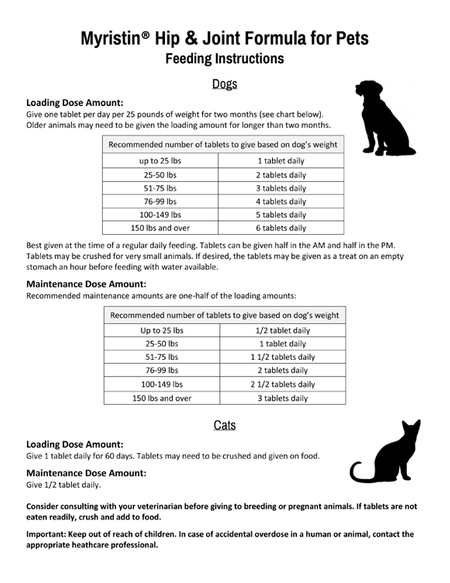 The 120 count bottle is an appropriate loading dose (see feeding instructions) for small dogs, cats, and other small animals. The 240 count bottle is preferable for customers with multiple dogs, customers with large dogs, dog breeders, and customers with dogs on maintenance doses. This product is formulated with dogs and cats in mind. Please ask a veterinarian about suitability and dosage before giving to other animals. Some choose to instead give a combination of our Myristin® softgels and Myrist-Aid capsules to pets with allergies to ingredients in Myristin® Hip & Joint Formula tablets. This is a useful alternative that offers many of the same benefits to your dog or cat.